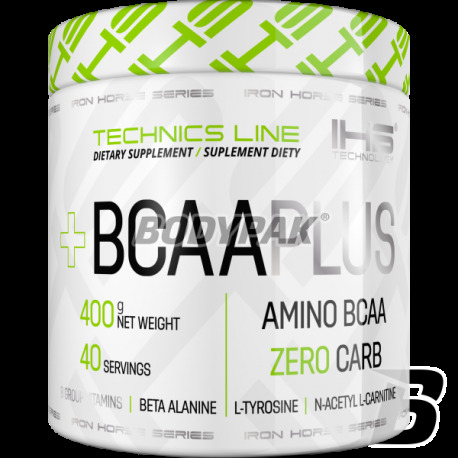 IHS BCAA PLUS - branched chain amino acids BCAA supplementation is the basis for any athlete! Therefore, they could not miss in a group of products prepared by IHS Technology. Number of proposals and forms of this product available on the market supplements for athletes motivated us to prepare something special. Scientists IHS Technology focused primarily on mapping the proportion of BCAA found in human muscles. 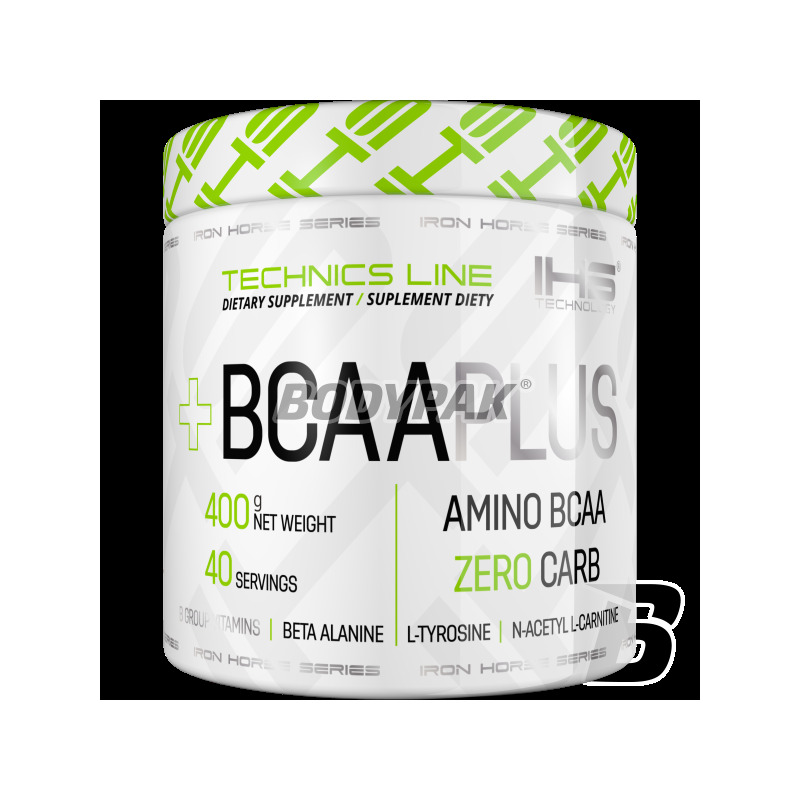 Therefore, leucine, valine and isoleucine in BCAA PLUS have been composed in the ratio of 1.3: 0.9: 0.8 which is a reflection of their natural forms. This composition is automatically becomes the most effective form of administration of branched chain amino acids. BCAA account for approximately 30% of our muscle in the absence of glucose or intense, there is a sudden effort for immediate combustion. Of course, you can prevent this by providing branched chain amino acids from the outside. The addition of beta-alanine, Histidine and B vitamins found in BCAA PLUS determines the rise karnotyzyny, which is used in energy processes occurring within the muscle. Its decay energy provides extended working muscle without acidification, which allows for a more intense workout. Tyrosine complex and Acetyl L-carnitine together with magnesium and B-group vitamins used in our product give adequate concentration and improving the quality of communication brain - the muscle during exercise. Tyrosine is a precursor of dopamine, serotonin and norepinephrine, and Acetyl L-carnitine is responsible for the improvement in nerve conduction. Reaching BCAA PLUS get so complete product. Flawlessly balanced proportions of branched chain amino acids, enriched with a set of materials that act synergistically to improve the quality and duration of your workouts. Our proposed combination of amino acids with an appropriate amount of B vitamins and magnesium guarantee the development of muscle tissue and provide an appropriate substitute for energy during intense training. Składniki: l-leucyna, l-walina, l-izoleucyna, beta alanina, l-tyrozyna, n-acetyl-l-karnityna, l-histydyna, cytrynian magnezu, chlorowodorek tiaminy, chlorowodorek pirydoksyny, cyjanokobalamina, substancje słodzące (sacharynian sodu, sukraloza), aromat owocowy (cytrynowy dla smaku cytrynowego, ananasowy - dla smaku ananasowego, owoców lasu - dla smaku owoce lasu), substancje barwiące (kurkuma - dla smaku cytrynowego, oraz dla smaku ananasowego, ekstrakt z buraka czerwonego, dla smaku owoce lasu), substancja przeciwzbrylająca: dwutlenek krzemu. Bardzo przypadł mi ten produkt. Zdecydowanie IHS BCAA to dobry suplement na regenerację. Próbowałem już trzech smaków i póki co wygrywa pomarańczowy. Smak torpeda, a rozpuszczalność wersji instantyzowanej bije na głowę inne produkty. Dobra rzecz dla zawodnika MMA, biegacza i kolarza. Najlepiej ładować minimum te 3 porcje w ciągu dnia w tym dwie okołotreningowo. Ogromny plus za dodatek Bety i Karnityny. Bardzo dobre bcaa lubie brać w tygodniu gdy mam nocki bardzo dobrze się czuje oraz pobudza nie jestem senny ,a nie muszę wspomagać się kawą ! plusy to smak pomarańcz (5/5 oraz rozpuszczalność 5/5 ! Smak jak smak (jest niezły), plusem jest rozpuszczalność i stężenie bcaa w bcaa ;).